VATICAN CITY, JUNE 4, 2007 (Zenit.org).- Cardinal Tarcisio Bertone says the waiting is nearly over for the much-discussed papal document that will reportedly liberalize the use of the Tridentine Mass. The Vatican secretary of state said this in an interview with the Catholic newspaper Avvenire on Sunday. "I believe that we will not have to wait much longer for its publication," Cardinal Bertone said. "The Pope is personally interested in seeing this happen. He will explain it in an accompanying letter, hoping for a serene reception." Later on during his Apostolic Journey to Brazil last May, he expressed his intention to liberalize or make more accessible the pre-conciliar Tridentine liturgy, due significantly to certain groups in the Church pushing for its restoration. 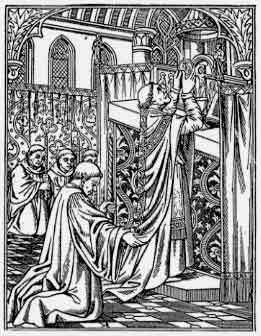 We must remember that the Tridentine liturgy was not suppressed by the New Order of Mass and continued to coexist with the latter although in a more limited way. Already, many concerns are beings raised. Especially in these parts of the world like ours in the Philippines where there are many uneducated, even illiterate people who cannot even understand English, there many real complications that can arise. Rich and lettered people, with some primer or refresher Latin course, can easily go to Latin liturgies and be able to participate actively and intelligently in them (a key Vatican II precept we must never abandon!). Apparently, the poor and unlettered people will be easily left behind. Hence, the Church will be visibly divided in what is supposed to be one of the most visible if not the most significant expression of its unity: the celebration of the Holy Eucharist. Nevertheless, we must remain open even as we try to discuss and discern the possible impact and implications of these developments not only for our liturgy but for our life as Church, universal and local. I don't think the latin rites are appropriate for filipino catholics. 'Sacramentum Concillium' Clearly states the use of local languages in the celebration of the mass and it is one of the unifying factor in the church. Whether we like it or not, Filipino Catholics belong to the Roman Rite therefore the Roman Rite is applicable to us, whether it is in the ordinary form or the extraordinary form. Doesn't the same Constitution state: "Particular law remaining in force, the use of the Latin language is to be preserved in the Latin rites."